Just the best magazine ever! This is seriously just the best magazine ever! I don't believe that is an exaggeration and no one has paid me to say that. :-) This is the only magazine that I would want with me if stranded anywhere. It is like a fun facts, brain-loving smorgasbord that I want to gobble up every month. It is so fun to read and I always learn something I did not know. 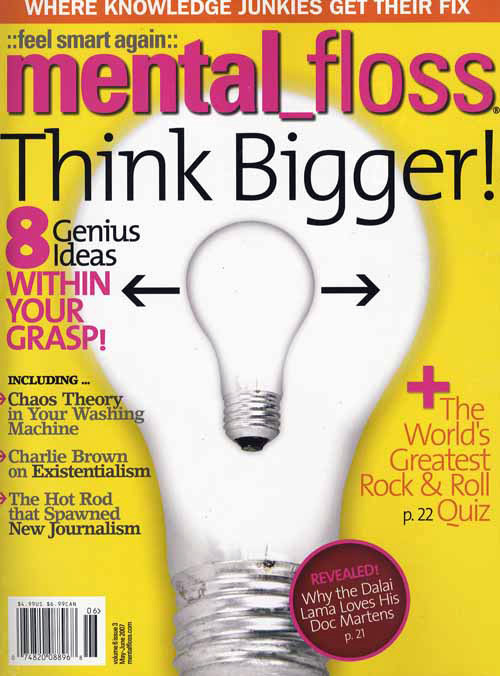 I picked up a copy of Mental Floss in my doctor's office a few years ago & was hooked. I have been an avid reader (and a subscriber) ever since. The magazine's combination of pop culture trivia & historical minutiae is unlike any other I've read. Light reading that encourages deep thinking. Highly recommended! The best part about having this magazine as your "bathroom reading" is that when someone finally comes out, you are sure they are going to make some remark about something crazy they just read. My father will even have a little trivia, and we just joke and say, "So.. you found the most recent issue of Mental Floss, eh?" Very interesting, great to have around for family and guests. this magazine is interesting it has cool facts and you could bring them up and start a chit chat.